Putting the PUBLIC in Public Art! The Cultural Council of Greater Jacksonville and its Art in Public Places is administering two neighborhood public art installations on behalf of the City of Jacksonville in Districts 8 and 10. One sculptural installation is for a traffic triangle in the roadway surrounded by Winton Drive and Ribault Scenic Drive in front of Jean Ribault Senior High. Another 3-D piece of art is designed for the outdoor entry-way of Legends Community Center on Soutel Drive. A city council member-designated funding for public art is combined with the City of Jacksonville’s capital improvement percent for art to create the two iconic public art pieces for the neighborhood. Single family residences, schools, churches, parks and businesses comprise the neighborhood area. There is an exceptionally strong sense of community and family among the residents and heritage is an important component. Community involvement is crucial to these projects and area stakeholders are encouraged to participate in public meetings with the artists. Artists do not produce proposals prior to selection and awarding, but must engage with the public, make site visits and perform research on the history and culture of the neighborhood before creating designs. A nine member Art Selection Panel made up of community representatives, city department representatives and arts professionals selects the artists and the designs for both projects. The Art in Public Places Committee will have final approval on designs, which will also be reviewed by an arts conservator for sustainability. 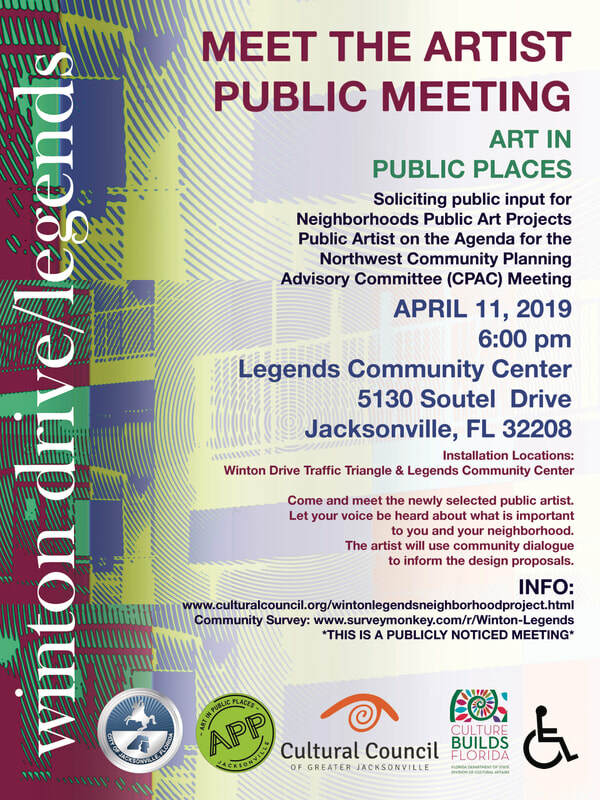 The Cultural Council of Greater Jacksonville, Art in Public Places and the City of Jacksonville, Florida issued a Call to Artists for a Request for Qualifications for Winton Drive and Legends Community Center Neighborhood Public Art Project. The RFQ (Request for Qualifications) solicited artists who can address streetscape aesthetics with iconic and potentially interactive public art that serves to engage vehicular drivers and sidewalk pedestrians at Winton Drive and experientially enhance the outdoor entrance to the Legends Community Center for approaching visitors. Artists or artist teams are encouraged to explore ways to integrate public art with technology and renewable sources of energy such as wind and/or solar. For the two categories of environmental 3-D sculpture, preference is given to artwork that incorporates lighting or luminescent elements and/or media arts or other digital interactive art for creative placemaking. Jacksonville is interested in showcasing eco-friendly, forward thinking aesthetic designs that find solutions to environmental concerns, such as incorporating solar-powered lighting. The iconic Winton Drive Traffic Triangle public art project category in front of Jean Ribault High School was conceived and funded by Jacksonville city council members to inspire and promote the adjoining city council districts 8 and 10. The public art for Winton Drive is to serve as a symbol for the neighborhood, with community input from students, faculty at nearby schools, members of nearby churches, residents and businesses. Selected artist or artist team will create a large sculpture, situated in a traffic triangle and viewable from a distance as well as by pedestrian and vehicular traffic from all sides day and night. This project is to contain an educational component and may fuse technology and public art to create a sculpture that may be digitally interactive using smart phones or other technology to create unique experiences and incorporate renewable sources of energy if possible. The sculpture must comply with traffic engineering standards for traffic triangles. The sculpture is not intended to be approached by pedestrians, but plans for appropriate landscaping should be addressed. Artists may conduct educational outreach for nearby schools. ​CIP-initiated funding of the Legends Community Center allotted resources for public art to be placed in front of the community center on Soutel Drive, in cooperation with the Parks Department. Public art will feature a prominent environmental outdoor sculpture for the entrance to the community center to promote the spirit of the neighborhood. The artwork will incorporate elements of light and/or wind using renewable sources of energy when possible. lighting will improve security at night. Inside the community center are gathering rooms and a gymnasium for community events such as town hall meetings, stage shows, weddings, funerals, classes, dances, basketball games and the “Meet the Artists” event for the Neighborhood Public Art Project..The community center is adjacent to the Bob Hayes Sports Complex and Park and served as a key shelter for nearby residents during recent hurricanes. Community participation is vital to the creation of this representation of the neighborhood. Jacksonville, FL: The Cultural Council of Greater Jacksonville’s Art in Public Places is pleased to announce Calls to Artists for Requests for Qualifications (RFQ’s) to create three sculptural public art installations to be placed in Jacksonville neighborhoods. The calls solicit artists who can work with neighborhoods to create 3-D, wayfinding and technologically interactive artworks to represent, enhance and complement community identity. Applying artists will be encouraged to explore innovative designs and technologically interactive experiences that integrate components such as light, new media or kinetic energy into the public art with a neighborhood focus. Artists interested in finding out more about the calls to artists may attend and address questions to Art in Public Places staff members. Questions and answers will be posted on the Art in Public Places webpage for reference following the Q & A Session: (www.culturalcouncil.org/callstoartists.) Doors open at 5:30 pm at MOCA for Every Single Artist Lounge, an informal monthly gathering event for creatives. The Neighborhoods Public Art Projects have been championed by the respective Jacksonville City Council Members of City Council Districts 8, 10 and 5 and funded by a percent for art dedicated from eligible Capital Improvement Projects and city council member discretionary funds. The deadline to apply for the calls is February 9, 2019. Proposals are not part of the application process. Selected artists are expected to visit the Jacksonville neighborhood sites at 3701 Winton Drive, 5130 Soutel Drive or 4380 Emerson Drive and engage with the respective communities before creating site specific design proposals in the summer. Information about Art in Public Places may be found at www.culturalcouncil.org/art-in-public-places. Every Single Artist Lounge (ESAL) affords artists and those interested In the Jacksonville arts community an opportunity to network with other artists and community members on a monthly basis. More information about ESAL may be found at .http://www.culturalcouncil.org/esal.html (@moreartculture). The Cultural Council of Greater Jacksonville champions the appreciation, relevance and expression of art and culture. The Council stewards the City of Jacksonville's annual appropriation to the arts and culture, contributes to economic vitality through arts and culture initiatives, and leads advocacy efforts to demonstrate the impact and significance of culture in the community. The Cultural Council is sponsored in part by the City of Jacksonville and the State of Florida, Department of State, Division of Cultural Affairs and the Florida Council on Arts and Culture.